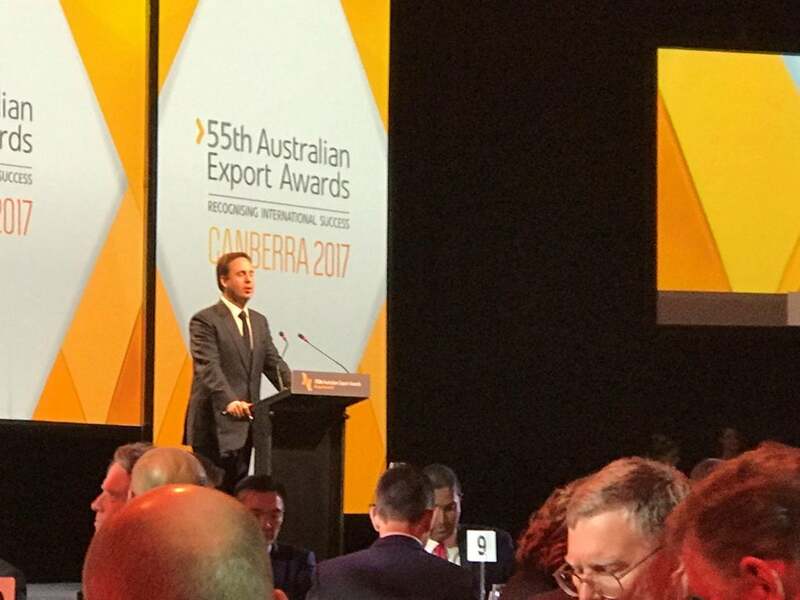 The 55th Australian Export Awards took place in Canberra on 5th December 2017. Before the ceremony Cogito Group enjoyed a National Finalists’ Masterclass at Kurrajong Hotel. This included a keynote presentation by Dr Michael Rosemann, Executive Director from QUT. He focused on how digitisation will impact the business environment, what the implications are for Australian businesses and what we need to be doing now, to ensure we remain globally competitive into the future. After this presentation there was an informative panel discussion. In the evening, all finalists attended the awards ceremony at Parliament House. The Honourable Steven Ciobo MP, Minister for Trade, Tourism and Investment attended the awards to celebrate the achievements of Australia’s most innovative exporters. Mr Ciobo explained that there were 77 finalists at the Australian Export Awards, which generated more than $3.9 billion in export sales last year and employed more than 31,000 people. Cogito Group were privileged to be in the room with some of Australia’s finest businesses and to contribute to that figure. Cogito Group were finalists in the Business Services category. This award is for outstanding international success in professional business services including legal, accounting, administration and support services, business management, marketing services, franchising and licensing, engineering, finance and insurance, market research and translation services. Linear Clinical Research, from Western Australia, came out victorious in the Business Services category. A very deserving win from this company which provides early-phase and first-in-human clinical trial services to the global pharmaceutical and biotechnology industries. Thank you to Austrade and The Australian Chamber of Commerce and Industry for organising a wonderful awards night showcasing what Australian business offers the world.